A MAN was hit repeatedly on the head during an attempted robbery in Fareham. Police have only just released a CCTV image of three men they would like to speak to in connection with the incident. The 50-year-old victim was approached by suspects, threatened and assaulted in an alleyway on Lower Quay, Fareham. Demands were made for his money and phone. His attackers then hit him repeatedly. The suspects left empty-handed and headed towards Fareham town centre. 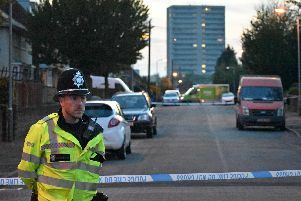 A spokesman from Hampshire police said the victim sustained injuries to his face and head during the attack at around 2.10am on Monday, August 27. He was treated for his injuries in hospital. Anyone with information or who recognises the three men in the CCTV image should call Hampshire Constabulary on 101 quoting crime reference number 44180324067. Alternatively, information can be giving anonymously to Crimestoppers by calling 0800 555 111.